Is Your Nonprofit Strategically Deprived? 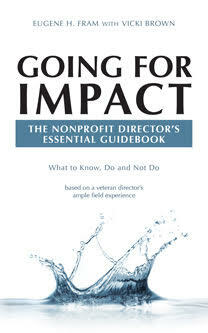 A vital concern to the future of any nonprofit organization is frequently neglected. Responsibility for the lack of strategic planning must reside with the chief executive, board members and the tactical challenges that inevitably flow to the board. •	have a fully engaged chief executive involved with the board in the leadership of the strategic planning process. •	have a proportion of board directors with some specific types of strategic oriented experiences. For example, one faith based organization recreational facility I know built a modern new building. However, the leadership was unaware of the quietly growing demand for preschool education in the area. As soon as the new building was opened, several parts of the structure had to be remodeled to accommodate a growing preschool population. While I admit that planning for coming societal and behavioral, changes is difficult, like the one in the example, I suggest that any nonprofit board needs to take “inventory” of the following backgrounds of the current chief executive and board members. How strategically capable is the organization’s chief executive? Does he or she stay at the leading edge of the field? Has the board recruited the chief executive for a strategic acumen or for just keeping the organization on a stable course? How successful has an organization been in recruiting some of the following types of board members? 1. Those with enough time to become thoroughly acquainted with field related to the mission, visions of the organization’s operations. After all, many nonprofit directors serve on boards whose fields of focus are quite different from those in which they have working experience. 2. Those who can distinguish between a strategic plan and a tactical plan? 3. Those capable of critical thinking, questioning past assumptions as they relate to the future assumptions. 4. Those who have had successful strategic planning experiences at a high (not tactical) levels on other FP or NFP boards. 5. Those who have innate visionary abilities to assess future opportunities or roadblocks. 6. Those who have failed with past unsuccessful strategic plans but learned from their mistakes. 7. Those who can realistically project the financial challenges a strategic plan will develop. 8. Those with significant prior NFP or FP experience who can be models for younger directors with time restrictions who contribute via time limited task force assignments. But they need much more seasoning with understanding governance functions because they often rubber stamp board chair or CEO suggestions. ** In the 2012 Nonprofit Governance Index, Data Report 1. published by BoardSource, 40% of nonprofit chief executives surveyed gave their boards grades of C, D or F for strategy planning. Most of our clients do not have a strategic plan or if they do it does not impact their decision making on a regular basis and while I appreciate your blog comments here the use of the word “fully” concerns me as so many organizations do not “fully” understand the difference between strategy and tactics or do not have a “fully” engaged CEO. What should organizations like these do? Must they “fully” understand to be successful strategically or is there any way to engage in flawed planning and have it be successful? Is flawed planning better than no strategic planning at all? Nathan: Thanks for thought full question. Those nonprofit organization I have observed who have had a robust strategic plan started with the following elements. First a CEO who fully understands the process, has seen too many plans sit on the shelf, with hundreds of hours wasted, Second is a small group of directors who are opinion leaders and can “teach” others about the process and who quietly also may lead the others in the development of a robust plan. This is a tall order for many nonprofit boards because many directors think that they have intuitive foresight, without any empirical evidence of it. Also they may consider a SWOT analysis a strategy plan. A flawed plan will never pass muster for directors who understand the process. Consequently, it is best to recruit qualified directors who can work with the qualified CEO to move the board in the proper direction. Opportunities can be missed during the gestation period, but it is better than developing a flawed planning culture. Changing culture is even more difficult.